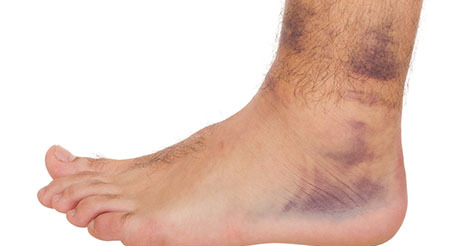 A syndesmosis ankle injury is what most athletes know as a high ankle sprain. It is a source of some confusion, especially in terms of how it relates to the length of time it takes an athlete to get back to sports. It’s a very common injury in cutting and pivoting sports that involve changing directions frequently, such as football and hockey. Traditional ankle sprainsinclude the very common lateral ankle sprains, which injure the ligaments on the outside of the ankle, and the less common medial ankle sprains, which involve the ligaments on the inside of the ankle. Syndesmosis injuries involve the ligaments between the end of the tibia and fibula. As such, the pain is felt higher than the typical ankle sprain. Usually athletes notice pain at the lower part of the leg with any kind of weightbearing. This pain is often felt in addition to pain at the locations of typical lateral or medial ankle sprains. They typically involve higher energy injuries and unfortunately can take longer to heal. An athlete with a syndesmosis sprain will usually have pain above the ankle between the tibia and fibula (white circle). Examination by a sports medicine physician can be very helpful in diagnosing a high ankle sprain. In addition to tenderness along the lateral ankle ligaments or medial ankle ligaments, an athlete with a high ankle sprain typically hurts at the end of the leg just above the ankle. One common test involves the squeeze test in which the examiner squeezes the ends of the tibia and fibula together, recreating the athlete’s pain. The physician can also dorsiflex the ankle (flexing the toes toward the patient’s head) in combination with externally rotating the ankle. This maneuver can increase pain in someone with a high ankle sprain. X-rays typically do not show any new injury compared to traditional ankle sprains. It is typically a diagnosis made by physical examination. Injury prevention techniques. Unlike some of the more mild lateral ankle sprains, syndesmosis ankle sprains can often take four to six weeks to heal to the point where an athlete can try to return to sports. The treatment of the injury is not much different than with traditional ankle sprains, although the physician may be more inclined to try ankle stabilization braces while the patient tries to bear weight. Rehabilitation is similar in the sense that the first efforts are aimed at decreasing pain and swelling while improving range of motion. Strengthening and proprioception are added when the athlete is comfortable, when he or she can walk normally, and he or she has good motion of the ankle. The athlete might then be allowed to start jogging before returning to sport-specific drills. One key with this injury is to diagnose it immediately after the injury occurs. It is common for an athlete to be diagnosed with an ankle sprain but the syndesmosis component of the injury is missed. Failure to note injury to the syndesmosis can be a source of frustration to the athlete and coach, as the patient might not improve as quickly as he or she expects. Proper diagnosis initially can lead to a more reasonable expectation of the time it will take to return to sports.